This summary of our church history was written in 1978 to celebrate the church’s designation as a National Historic Place. In Colonial Days, The English Church stood on a crossroads busy with farmers and continental troops. It still stands on that busy American crossroads, watching over change, unchanged and lovely as ever. Why did they call us “The English Church”? The reply is that we were the only church conducting a service in English. Until our establishment in 1734, the only church was the Dutch Reformed (1694). It had services in Dutch in distant Tappan. Records show that Samuel Coe was the principal founder of this Church, arriving here with his family shortly before 1734. He built his home across the road, just west. Services were held in an old log schoolhouse, nearby. In 1742, young Samuel Coe inherited his father’s lands and gave New Hempstead about a quarter of an acre. They decided to put up a church a bit north of us. In 1827, the old church was taken down and in the same year a new church, the one we attend today, was built at a total cost of $1625.30. This included $148.80 for a bell, a rope and blacksmithing. During the Revolution, The English Church was host to part of General Woodford’s army and on more than one occasion, Washington’s Troops camped on this ground. 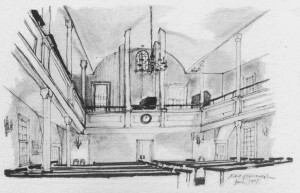 In the Nation, our Church, founded in 1734, still serves its congregation and community on an American crossroads.